“Stunning Beatles firework display transforms Woolton into magical land” was the headline from The Liverpool Echo… and what a night it was! Suspended Time – an event inspired by the song Lucy in the Sky With Diamonds took place in Woolton Woods, on Thursday 1 June in a world premiere event creating a magical space of performance, story-telling, music, light and pyrotechnics. Attendees to the free event couldn’t believe how amazing it was. You can read more about the Beatles and their landmark album here. Join a walking tour to explore the Beatles, local hangouts. Fireworks make any celebration extra special – you may not have space for a giant tribute to the Beatles but that doesn’t mean you can’t celebrate birthdays and other occasions with a bang! 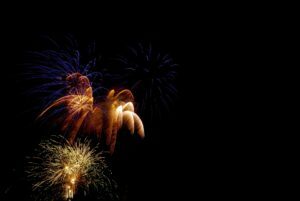 We recommend you buy your fireworks from an official seller to ensure you get a quality product and the most spectacular display to suit your budget. Read more about what’s on in Liverpool here and let us know what you think of our beautiful city!